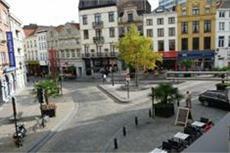 The Best Aparthotel Brussels is situated in the historic center of the city. Guests will discover that they are 5 minutes from Grand Place by foot. The hotel also offers easy access to Mannekin Pis and other Brussels attractions. The Best Aparthotel Brussels is situated within 5 minutes walking distance of the central station. Local trams, taxi cabs, and rental cars provide travelers with easy access to the many points of interest located throughout Brussels, as well as to the international airport which is located only a short driving distance away from the hotel. Both of the guestrooms at the Best Aparthotel Brussels are renovated apartments. Each room includes wireless Internet access as well as high ceilings and wooden floors. Private bathrooms can be found in both guestrooms. Guests will find that there are a large number of shops and restaurants near the hotel. There is a modern décor throughout the property. The hotel is located in a remarkable 17th century building.